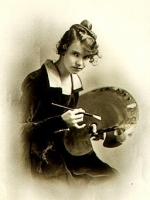 Wanda Hazel Gág was an American artist, author, translator and illustrator. She is most noted for writing and illustrating the children’s book Millions of Cats, which won a Newbery Honor Award and the Lewis Carroll Shelf Award. It is the oldest American picture book still in print. The ABC Bunny also received a Newbery Honor Award. Her books Snow White and the Seven Dwarfs and Nothing at All each won a Caldecott Honor Award. In 1940 a book of edited excerpts from her diaries covering the years 1908 to 1917 was published as Growing Pains; it received wide acclaim. Howard Simon explores methods, techniques, and examples of the great illustrators from the dawn of printing to the twentieth century. The rhythmic and rhyming text tells the story of Bunny, driven from Bunnyland to Elsewhere after an unfortunate accident with an apple. Every letter in the alphabet is represented in Bunny’s journey. The illustrations are original lithographs drawn by Wanda Gág. A religious poem that became a best-selling classic in Puritan New England for a century after it was published in 1662.It describes the Day of Judgment, on which a vengeful God judges and sentences all people. The king promises the hand of a princess to the hero who rescues the missing maidens. Bobo lives in a cozy, well-appointed cave and spends all his time cooking customized, delicious-sounding meals for the local animals. Then one day, a dragonlike entity appears and requests a meal made of doll heads. Fritzl works hard in the fields every day. Liesi works hard all day, too. But when Fritzl complains about how hard he works and how easy Liesi has it, they trade places. The outcome is hilarious. Wanda Gág rose from poverty in small-town Minnesota to international fame in the 1920s as the author of the children’s classic Millions of Cats. Her early diaries are the touching, often humorous record of her youth and her struggles to develop her talent. John Martin’s Book was a children’s magazine aimed at five- to eight-year-olds. Martin Gardner wrote that it was the “most entertaining magazine” aimed at this age group published in the U.S.
An elderly couple realize they are very lonely. The wife wants a cat, so her husband sets off in search of one. Each seems lovely, so he walks back home with millions of cats following him. A collection of traditional fairy tales, fables and nursery rhymes for younger children. This is the story of the adventures of two field mice. A collection of stories and poems from Story Parade magazine. This volume includes Millions of Cats, The Funny Thing and Snippy and Snappy.